This is a streamlined version of a Jacques Torres cookie recipe. If you really can't resist, bake the dough as soon as you make it. But the longer you let the dough sit in the fridge — three or even four days is best — the mellower and toastier the flavor will be. The recipe makes an enormous amount of dough, so if you like, simply wrap the dough in plastic, stash it in the fridge, and bake chunks of it over the course of a few days. The cookies are best eaten warm from the oven. Sift together the dry ingredients (the flour, baking soda, baking powder, salt, and cinnamon) and set aside. Put the butter and sugars in the bowl of a stand mixer fitted with the paddle attachment. Cream together until very light, about 5 minutes, scraping down the sides of the bowl as necessary. Add the eggs, one at a time, mixing well after each addition. Add the vanilla. Add the dry ingredients, about ½ cup at a time, mixing briefly after each addition. Scrape down the sides and bottom of the bowl to make sure everything is incorporated. Remove the bowl from the stand mixer and, with your hands, mix in the chocolate disks; be careful not to break the disks. Scrape the dough from the bowl onto a sheet of plastic wrap and gently press the dough together into a large mound. Wrap well in plastic wrap and refrigerate for 24 to 36 hours. When ready to bake, preheat the oven to 350 degrees. Line a baking sheet with parchment paper or a nonstick baking mat. Scoop 6 golf-ball-sized mounds of dough onto the sheet. Sprinkle lightly with sea salt (or wait until the cookies have baked and then sprinkle while the cookies are still warm). Bake until golden brown but still soft, 18 to 20 minutes. Let cool on the baking sheet atop a wire rack for 5 to 10 minutes, then use a broad spatula to slide the cookies onto a rack to finish cooling. Eat while still warm. Repeat the baking process with the remaining dough, or keep the remaining dough in the fridge until ready to bake again, up to four or five days. If you like the idea of a nuttier, caramelly-tasting cookie, but don't want to wait for the satisfaction, try the Cook's Illustrated suggestion of lightly caramelizing the sugars in browning butter. You can bake the cookies straight away, but they'll turn out rather flat and crispy. For puffier cookies, chill the dough at least 1 hour, then form into cookies and bake. 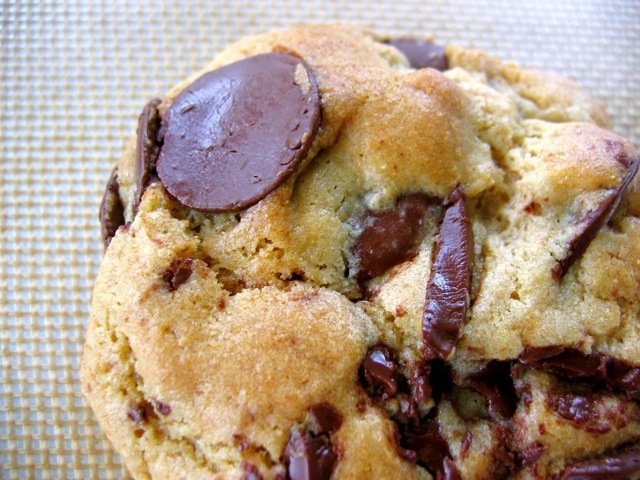 For double chocolate cookies, add 2/3 cup baking cocoa to the dry ingredients.